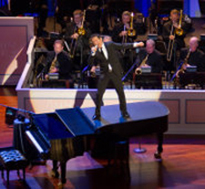 Michael Feinstein: The Sinatra Legacy premiered August 2011. Michael Feinstein Performs "Once in a Lifetime"
An exploration of the music that inspired Frank Sinatra, and the artists he inspired. Michael Feinstein, the multi-platinum selling, five-time Grammy-nominated singer, pianist and musical anthropologist has devoted his career to the rediscovery, preservation and performance of the historic material we know as "American popular song." In May 2011, Feinstein took center stage at the newly completed, multi-million dollar Palladium in Carmel, Indiana for an evening of songs dedicated to the legacy of Frank Sinatra. The concert, Michael Feinstein: The Sinatra Legacy, celebrated Sinatra and the writers, music and performers of the 1950s and 1960s when "Ol' Blue Eyes" reigned supreme. Backed by a 32-piece orchestra, Feinstein took the audience on a musical journey that explored how Sinatra influenced his contemporaries — voices like Rosemary Clooney, Nat King Cole, Sammy Davis Jr., Ella Fitzgerald, Dean Martin and many others — and how they, in turn, affected the incomparable singer. Michael Feinstein conjured up the musical legends of the post-W.W.II, pre-rock era using their extraordinary songs, which are also featured on his popular "The Sinatra Project" CDs, highlighted with intimate stories about their larger than life personalities. Born in Columbus, Ohio, Michael Feinstein started playing piano by the age of five. He began his career working in local piano bars after graduating high school and subsequently moved to Los Angeles, where he became Ira Gershwin's assistant. His work for Gershwin and the legendary composer's influence informed Feinstein as a performer, composer and arranger of his own music as well as his unparalleled interpretions of the music of the Great American songbook. In addition to his busy touring and recording schedule, Feinstein serves as the director of the Jazz and Popular Song series at New York's Jazz at Lincoln Center; artistic director of Indiana's Palladium Center for the Performing Arts; and also has his own supper club in Manhattan, Feinstein's at Loews Regency, which opened in 1999 and where he headlines every holiday season. "Put on a Happy Face”/"Lotta Livin'"
"There’ll Be Some Changes Made"
Michael Feinstein: The Sinatra Legacy was produced by Tim Swift and Kristi Foley. Own this DVD to experience Feinstein's interpretations of the classic songs of Sinatra. © Morey Management Group. All Rights Reserved. Photos courtesy of Zach Dobson.